Everything's cooler with lava, figuratively speaking. One way to make an artifact, weapon, or situation even better is to get lava involved somehow. After all, if something is already pretty awesome on its own, that said something would be really freakin' awesome if it happens to be using burning magma in the process. It doesn't matter if the lava is even relevant; just the inclusion of a flowing fiery-orange flow is enough to invoke the sense of raw power — strong enough to melt MOUNTAINS! — barely held in check. Broadly speaking, this trope covers instances where lava or magma is added to something just to make it better. Often invokes Convection Schmonvection. Also see Awesomeness Is Volatile and Incendiary Exponent. And to be clear: Magma refers to the material while it's still underground and not yet erupted from a volcano. Lava is the stuff when it's above ground. In Mahou Sensei Negima!, the ultimate spell of Earth element wouldn't be awesome enough without it. Great Mazinger: One of the weapons of Marquis Janus' Island Base was an artificial volcano built on the island could vomit rocks and lava when Janus needed. Naruto's Mizukage Mei can use Lava as a combination of fire and earth, in addition to her water, fire, earth and acid skills. She pulls this outta her sleeve. Becoming the Mask: It lampshaded and questioned on why the Hero's Forge - a high-stakes, Training from Hell Deadly Training Area - just so happens to have a supply of lava under it. In The Incredibles, the main dining room in Syndrone's island base features flowing lava walls as decor. The final showdown of Revenge of the Sith has Anakin and Obi-Wan duking it out on the lava planet of Mustafar. Dragonball Evolution has one inside a volcano where the MacGuffin is located. Wrath of the Titans has little to do with Greek myths overall, and its Kronos has nothing in common with the original version from the mythology, but boy, does he look great in lava! At the beginning of Inside Out, young Riley plays the "floor is lava" game. Later, the heroes go through imagination land and have to cross that very same lava. With couches floating in it. Many depictions of Fire and Brimstone Hell, especially visual works, will have bubbling pools and flowing streams of lava as background elements. Luke Skywalker spontaneously develops the ability to walk on lava in the first book of the Jedi Academy Trilogy. Luke walked across the lake of fire. He did not think about it. The lava refused to touch his feet. Only The Force burned bright around him. One step after another, he strode across the flaming rock, letting himself see nothing but his goal until he stood again on solid ground on the far side of the lake of fire, with Gantoris and his people. Gottlieb's Tee'd Off features a golf course set around an active volcano. Why? Why not? Dungeons & Dragons has the druid spell "Vulcan Bomb", which attacks a target with a stream of lava. Complete Arcane also has the arcane spell Transmute Stone to Lava. Magic: The Gathering has 44 cards that refer to lava or magma. They're all red. Yu-Gi-Oh! has the Lava Golem card. Only War: During a certain mission in the Final Testament adventure book, the player team is ordered to destroy a subterranean enemy camp located in mining tunnels beneath the planet's surface. One of the options is to carefully plant explosive devices and have it consumed by a river of lava. From BIONICLE, one of Toa Tahu's subsequent weapons is a Magma Sword. Toa Norik has the Lava Spear, which can shoot lava. The sport of Lavasurfing on the island of Mata Nui. Hakann has a Lava Launcher as his main weapon. Not only does Super Mario Galaxy feature Melty Molten Galaxy, a planet made of lava, but it's caught between two other planets also made of lava — a lava solar system. The sequel has Melty Monster Galaxy, which is inhabited by the titular monsters, who are often the same size as the planets they live on. One of the weapons in Ratchet & Clank: Going Commando is the Lava Gun, a modified flamethrower that shoots a continuous stream of lava. However, when fully upgraded in Ratchet & Clank: Up Your Arsenal, it becomes a Liquid Nitrogen Gun instead. Demon's Souls has the Lava Bow, which instantly transforms any arrow fired from it into a flaming lance. Dark Souls has two Lethal Lava Land levels. There are also the Chaos Pyromancies, the most powerful fire spells, which leave pools of lava on the floor when used. Diablo features the spell "Volcano", which spews forth lava. "Molten Boulder" applies as well, but is a round, condensed form of lava. World of Warcraft: Many fire-based spells, such as the Shaman spell "Magma Totem", features spell effects giving the impression of lava. Their icons also depict lava/magma in different forms. 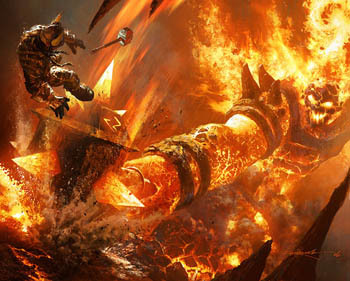 Molten Core has Ragnaros the Firelord, who wields Sulfuras, a gargantuan lava warhammer. In the Warcraft D20 RPG and trading card games, Sulfuras is available as a treasure. Players can craft a miniature version. Ask for help on the Dwarf Fortress forum, and someone will suggest solving your problem with lava. If you're already using lava, you should try using more. If your problem is too much lava, then what are you? Some kind of Elf? Metroid Prime: Hunters features the Magmaul, which is basically a magma grenade launcher. The underground realm of the Deep Roads in Dragon Age: Origins has a lot of lava, to the point that the dwarves have lava fountains and lava waterfalls as decorations in the same way surfacers might use water. Minecraft allows you to collect and use lava in constructions. If you can avoid being burned by it, of course. Lava also happens to be the longest-lasting heat source for furnaces; unfortunately, using a lava bucket in a furnace is a tedious processnote older builds used to destroy the bucket, consuming it like the lava. Later on, that was patched so the bucket remains, but it has to be manually removed so another can be put in its place; even with clever use of hoppers, the system still needs constant attention, as filled buckets don't stack, and depending on the map you may have to construct a portal to the Nether just to have a steady supply of lava. Then you run into the problem that getting the obsidian to create the Nether portal is best done with lava... GAH! Any fire-based dungeon in The Legend of Zelda series, especially volcano levels in the Death Mountain. Usually, you also have to fight flaming Keese and huge monsters that set themselves on fire. The strongest crafting material before entering Hardmode is Hellstone, which appears in lava pits, and emits lava when mined. Obsidian is created by dumping water into lava — in relatively small quantities in the normal game and enormous quantities if you build a generator. White 2 has Reversal Mountain filled with lava. Those who bought Black 2 will have water instead. Marathon has parts of the eponymous spaceship filled with lava for no other reason than Rule of Cool. There is lava in the next two games, as well, but at least some of this is in underground caverns where it would presumably make sense to have magma. Other cases in these games use Rule of Cool as well. In addition to all these examples, the Pfhor ships have some kind of coolant fluid which basically behaves as another kind of lava. Call of Duty: Black Ops II does it with a DLC map called Magma. It's a Japanese village, destroyed by lava. One would think that said village would be too dangerous to be an effective base. StarMade has asteroids with lava inside of them. You can collect it and sell it to stores. Monster Hunter 4 has the village of Harth, which is set next to a volcano. After restoring the lava flow, you get to see lava run through a creek in the middle of the village, which is used by the Troverians for their forging operations. Evolve's Behemoth monster can spit lava as an attack, averting Convection Schmonvection by sticking to the ground and burning anything that gets too close. In Junk Jack, lava can be used a light source, as a trap for other players in multiplayer, to kill mobs in your mob traps, as a method of transportation, etc. In Homestuck, the last of the four human kids to enter the Medium and escape the dying planet Earth lives on a dormant volcano. Naturally, in both the initial and rebooted timelines, it erupts just as they do so. There's even a dramatic kiss simultaneous with the second eruption. Also, Dave's planet, the Land of Heat and Clockwork is an Eternal Engine sitting in a Lethal Lava Land. One episode of Star Wars: The Clone Wars has a character killed in battle behind enemy lines. He's "buried" by having his shrouded body placed on a river of lava, whereupon it catches fire and drops over a lava fall. Why have a standard Disney Villain Death for the Big Bad in Teen Titans when you can have a Disney Villain Death with lava? In Avatar: The Last Airbender and The Legend of Korra, Avatars and a select few particularly skilled Earthbenders can control the stuff, even creating their own out of solid rock. Final Space: In episode 9, during an underwater mission, Gary has to rescue Quinn (who has been knocked out by a rock). Then magma starts to break through the Earths crust due to the effects of the breach in space. As Gary, Quinn and Mooncake try to reach the surface, streams of lava shoot out of the walls around them, instantly solidifying into glowing hot rock spires. At one point, Mooncake uses his powers to blast a way through such a lava stream. A favorite game of young children is to climb and jump all over the living room furniture while avoiding falling into the "lava" floor below. This childhood game is Played for Laughs in this xkcd strip. A dad (who works at Dreamworks as an animator), makes the game a reality .